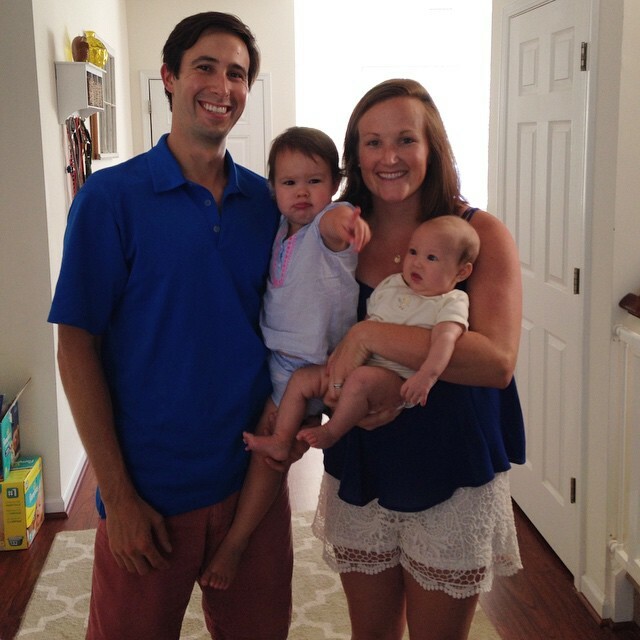 Megan’s blog post about her experience with Pilates before, during and after both of her pregnancies was so inspiring! I had a similar experience with my first pregnancy in 2013. Pilates helped me get through an amazing time of change in my body and I was able to continue practicing Pilates until a few weeks before having my son. I am now halfway into my second pregnancy and am so happy to be able to continue my Pilates practice. Although there are many things I am not able to do anymore (and that number will continue to grow as the months progress! ), there are still so many things I CAN do. I thought I would share a few of them with you! This is not a “how to” video series, but more of a glimpse into what one could do during pregnancy. Always listen to your body when doing any exercise program, especially during pregnancy! If you have any questions about whether Pilates is right for you, please consult your trusted healthcare practitioner. This first series of videos was taken when I was 17 weeks pregnant. At this point I was starting to “show”, had gained a bit of “preparing for baby” weight, but was able to still do much of my regular activity. Click on the red links to view the videos and use the “back” button on your browser to return to the post. The first exercise is a modification on The Hundreds. There are several ways to do this classical Pilates exercise on the mat and equipment. The Single Leg Circle- Mat and Single Leg Circle- Leg Springs are variations on the classical mat exercise. The support from the springs is really helpful in releasing the hip flexors and allowing for more freedom of movement in the hips and spine. Since I have stopped doing the upper ab curl, I now do the Ab Series on the Barrel. By having my hips on the small barrel I am able to work my deeper core muscles without straining the more superficial rectus abdominus (RA). The RA is the muscle that is prone to separation during pregnancy (called diastasis recti), therefore I am careful to avoid any exercises that might contribute to strain on this muscle and its fascia. Spine Stretch and Saw are both exercises that feel GREAT anytime, but especially during pregnancy. I modified Spine Stretch to add some extension for the spine. I also modified Saw by limiting the amount of lower trunk rotation. Hip strength is SO important anytime, but especially during pregnancy. The Side Kicks- Mat and Side Leg Springs are a great way to maintain and build hip strength. An obvious limitation that can begin anytime in the second trimester is the inability to lie on your stomach! The timing of when this position starts to feel uncomfortable varies from person to person. Listen to your body and do what feels right for you! I was feeling fine being on my belly at 17 weeks, so I continued to do Swan- Mat and Push Thru Bar. The final series is not from the classical Pilates method, but is often included and feels GREAT! Cat/Cow and Planks stretch the spine and build core strength. Guest post by Pilates-based Physical Therapist, Megan McCoy. It was during college and graduate school that I started to fall in love with running. Not only was it a great way to get in my cardio workout, but it was also a great outlet for stress. During all the years and miles that I’ve been running, I have not had the overuse training syndromes that plague many runners. No ITB pain. No hamstring tightness. No plantar fasciitis. Call me lucky? Perhaps. But I must thank Pilates for keeping me out on the road running. Pilates has kept my muscles lengthened and core activated. My pelvic stability has been strong enough to train for long distance runs and adapt to all sorts of terrain. Pilates also has encouraged proper movement patterns and helped prevent against future injuries. Not only has Pilates helped my running, it was conditioning my body before I even became pregnant. When I first learned I was pregnant, I was overcome with excitement! That excitement was soon met with a wave of nausea that soon made it hard to do anything but the necessities of life. Green from nausea and a fatigue that I had never experienced before, my favorite form of exercise – running – was quickly out of the picture. I realized I was able to continue with my Pilates practice and was so very thankful to be able to keep moving! During the Prenatal Period I quickly realized just how important Pilates is for a pregnant body. Abdominals: Having a strong abdominal wall helps the body accommodate to one’s ever growing belly. The more engaged the core, the less likely one is to suffer from aches and pains. I truly did not have much low back pain during either pregnancy! Back Muscles: Keeping these muscles strong can help reduce the stress on your body as one gets used to her new center of gravity. It becomes difficult to maintain good posture, but it is crucial to help reduce aches and pains from the increased lumbar lordosis (curvature of the low back). Pelvic Muscles: Pilates exercises can help strengthen the pelvic floor, which in turn will help support the bladder, bowels, and uterus during pregnancy. Keeping these muscles strong will also aid during the labor and delivery phase. Breath Control: The breath is very important in Pilates and during pregnancy! It’s a great way for pre-labor practice to help breathe through contractions and make the pushes more effective. It’s also a great tool to use when one can’t perform an upper abdominal curl but still engage the abdominals. Now after having two sweet baby girls, just 15 months apart, I have Pilates to thank for much more! I truly believe I was able to maintain the stamina for 5+ hours of pushing due to breath control and strong abdominal and pelvic floor muscles. Many new moms experience diastasis recti – which is essentially a split in the abdominal wall muscles. For some it is easily noticeable and others it is not. The good news is that if you are reading this and you think you may have it, the PTs at IOBT would be happy to help you properly find your abdominals again! With both pregnancies, I have not experienced any split in my abdominals due to all the Pilates strengthening. Also many new moms say, “Oops I pee accidentally when I sneeze/cough/etc…” This is NOT normal. Again we would love to help you strengthen your pelvic floor if this sounds like you. I have not had any issues with these pelvic floor problems, even with both babies being at normal and above average birth weights! I truly believe I can thank Pilates for not having a lot of these common issues post delivery. During the Postnatal Period, Pilates has helped me realize just how strong our bodies are. It has been a great complement to starting to tone and strengthen my postnatal body. While we are all eager to get back to our pre-baby bodies, take time to heal and listen to your body. My daughters are just about 22 months and 6 months old, and I am still re-learning my body. In the first 2 to 6 months postpartum, the body is at the highest risk for injury. Enjoy your favorite form of exercise and all the benefits it gives you and your body. Instead of getting hung up on trying to run your pre-baby mile time or getting back into your skinny jeans, enjoy the ride. Also, remember to cut yourself some slack – you just gave birth to one of life’s greatest miracles. Check out Megan’s full bio on our staff page and call the studio to set up a Pilates-based Physical Therapy evaluation (919-361-0104). One of my goals for this blog was to provide information on all areas of Healthy Living, therefore I have decided to start posting healthy recipes from our clients and staff! If you have a recipe you would like to share, please let me know. We will mainly be sharing recipes that incorporate seasonal, whole foods. The first recipe is a suggestion from Lorien, one of our fabulous Pilates instructors. Lorien has been making a conscious effort to eat more fresh foods and this is one of her favorite new recipes. She made this delicious recipe substituting summer squash for the cucumber and agave for sugar. It tasted so yummy and she loved the feeling she got from eating this light and fresh meal! This recipe is from another blog (ohmyveggies.com) and comes from a great cookbook: The Oh She Glows Cookbook: Over 100 Vegan Recipes to Glow From The Inside Out. 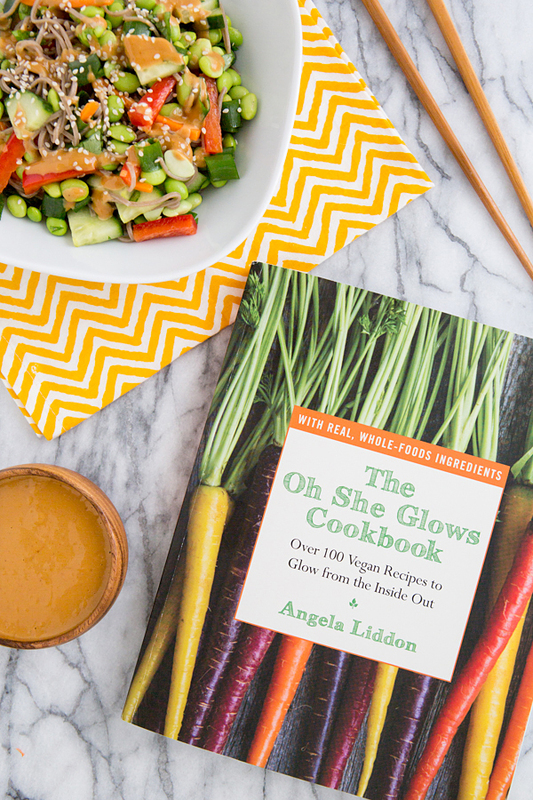 How could we NOT love a cookbook with that title? !